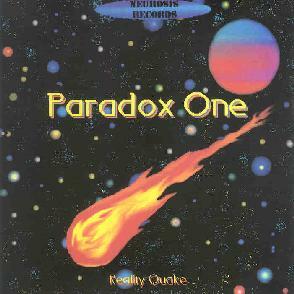 Paradox One - "Reality Quake"
Paradox One is a solo project from Phil Jackson, a Scottish musician who plays classic progressive rock that is mostly keyboard driven but includes a good bit of guitar. Reality Quake includes two epic tracks and two shorter ones. The first, "Urbmon 116", is a 4-part, 17-minute work based on Robert Silverberg's novel "The World Inside", Urbmon Monad 116 being the name of the 1000 story high tower block in the book. Part one starts with a brief introductory sequenced synth pattern, followed by a darker keyboard that sets an ominous tone, accompanied by samples of a panicking crowd. Part two starts with a more majestic keyboard sound, but it soon abruptly cuts out and then after a couple seconds launches into a more fiery proggy keyboard pattern. It has an old Alan Parson's Project style that I liked, but then, though not abruptly cutting out like before, transitions less than smoothly to Part three. Part three includes a few themes itself, one of which has a sound that recalls Triumvirat (circa Spartacus). It has a really nice melody accompanied by dark spacey synths that I would have liked to have heard developed more. There's an acoustic guitar and tribal drumming bit and more interesting keyboard segments that bring us to the music's conclusion. Lots of good ideas on "Urbmon 116", but I felt like Jackson rushed too quickly through too many of them, most noticeable I suppose because of the untidy transitioning which may have been remedied by better mixing. "Crompton Divided" is another multi-part piece based on a novel, this time Robert Sheckley's book of the same name. The track opens with a synth pattern similar to the one that opened "Urbmon 116". Again, Jackson moves too quickly through themes that are screaming out for just a little more development. But again, there's lots of good ideas here. I enjoyed the dark and intense atmospherics. And there's also more guitar on this track, Jackson's style being lo-fi dirty rock and there are some ballsy duets with the synth that I enjoyed. Of the shorter tracks, "The End Of All Things" is a rockin' Deep Purple styled keyboard driven tune with what sounds like classic John Lord Hammond organ. And "Kinderscenen [Scenes From Childhood]" is Jackson's interpretation of the 1838 Schuman composition. Very nice. In summary, Jackson is clearly into epic musical story telling and I think he's on the right track. Of course multi-movements are a characteristic of progressive rock but Jackson crams in too many without giving his ideas the development they deserve. And smoother transitioning between themes is critical. The liner notes state that depending on the reaction to his music Jackson would like to re-record parts of it... I'd say he could easily make an entire album out of either one of the epics on this disc. You can email Phil Jackson at phil7jackson@madasafish.com. For more information you can visit the Neurosis Records web site. Contact via snail mail c/o Neurosis; 20301 Ball Ave; Euclid, OH 44123.